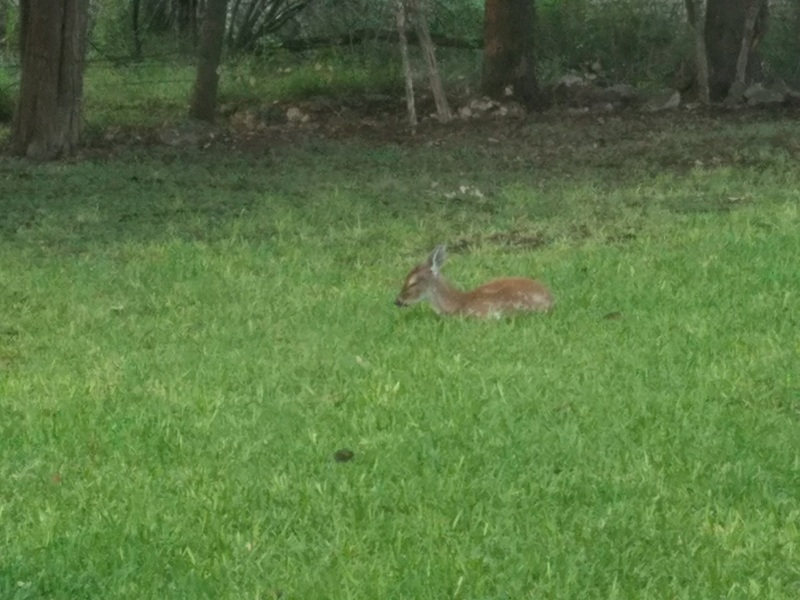 Part of the charm of our new home in Texas has got to be the wildlife. 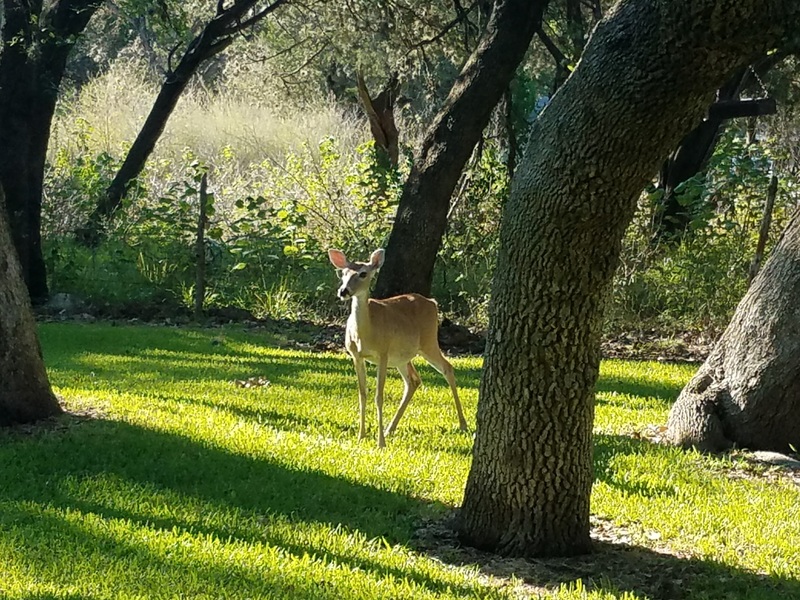 We live near Landa Park and Panther Canyon, and so we see deer, grey fox, possums, raccoons, owls, and scores of songbirds on a daily basis. 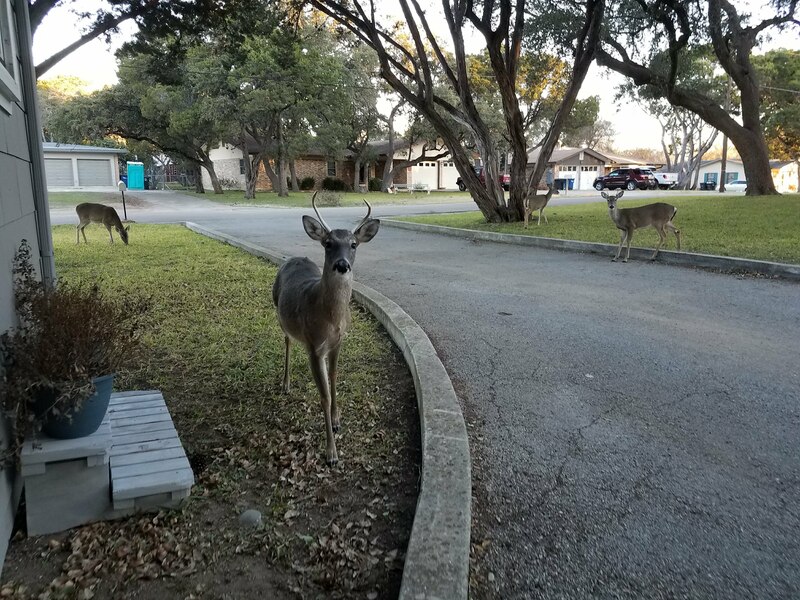 Despite being in the heart of New Braunfels, we’re still a small enough town to have deer roaming free and there’s a rather large herd that lives in our neighborhood. After living on the Windward Side of Oahu for four years, and in the foothills of the Front Range for two years before that, it’s a welcome lifestyle for my bride and me to be away from the city and immersed in a more natural state. The Texas Hill Country is by far my favorite part of the State. I grew up in Ft Worth, on the edge of the Great Plains and surrounded by rivers and lakes. Even as much as I sorely miss my beloved Pacific Ocean and the Hawaiian Islands (who wouldn’t? ), the Texas Hill Country offers spectacular views and interesting wildlife. This on top of the funky mix of Anglo, Mexican, Indian, Czech, and German influences. Of course, the most welcome surprise for us were the deer. My sweet bride is my very own Snow White. She has a way with the animals and they seem to instinctively see her as a friend, or even a mother. It doesn’t matter whether it’s deer, birds, ducks, dogs, cats, cows – or even wallabies – the animals sense her sweet nature and approach her. We started with just a few does who grazed and slept along the back fence and in a large bush in the backyard. Soon the herd began to grow! At present, there are two groups who frequent the yard: the ones I call “The Breakfast Club” and the “Afternoon Tea” group. Some folks attract the deer with piles of corn, but we’ve really fed them sparingly. We try to respect nature and never feed the wild things too much or too often. A little corn, oats and woody feed in the winter, and uncooked veggie scraps from the kitchen. Of course, there’s always water available for the birds and critters; my bride always wants to care for the ones who have trouble caring for themselves. One little guy in particular has been a special friend. 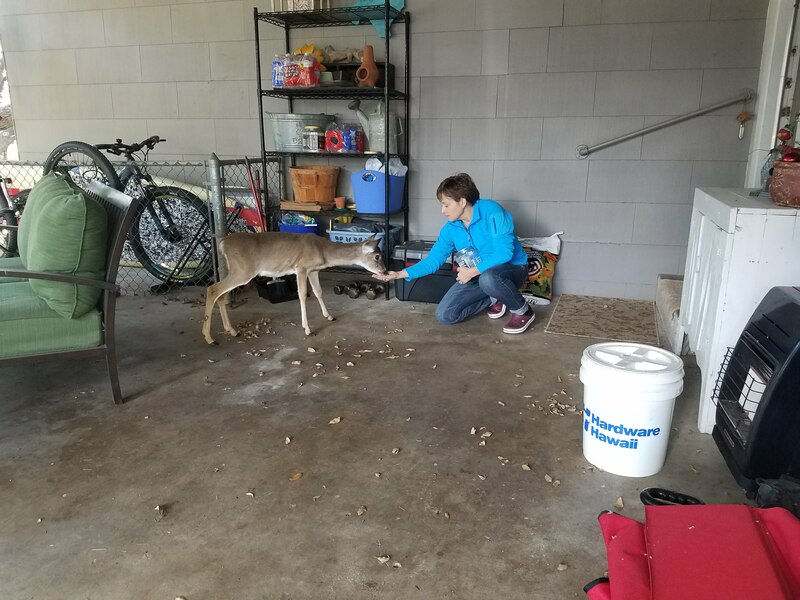 There were two late-season fawns, we named them “Jack” and “Chip.” The photo at right (I know it’s not very good), is Chip. Jack eventually stopped coming around as he grew up and started running with the bucks. But Chip was small and stayed with his mom. He is a very sweet little guy and immediately took to my wife, Snow White. He hears her when she’s outside, and follows her around like a little puppy. It’s not uncommon to see Chip appear at our back door, or front door, looking for a handout or just wanting to be near my wife. He was SO little I think he truly sees her as part of the herd! Of course, Chip is not the only deer who seems to know where the veggie scraps and corn comes from. Occasionally deer will appear at our back door and press their noses against the glass. You hate to reward that kind of behavior, but sometimes they’re just so stinkin’ cute it’s hard to say no. 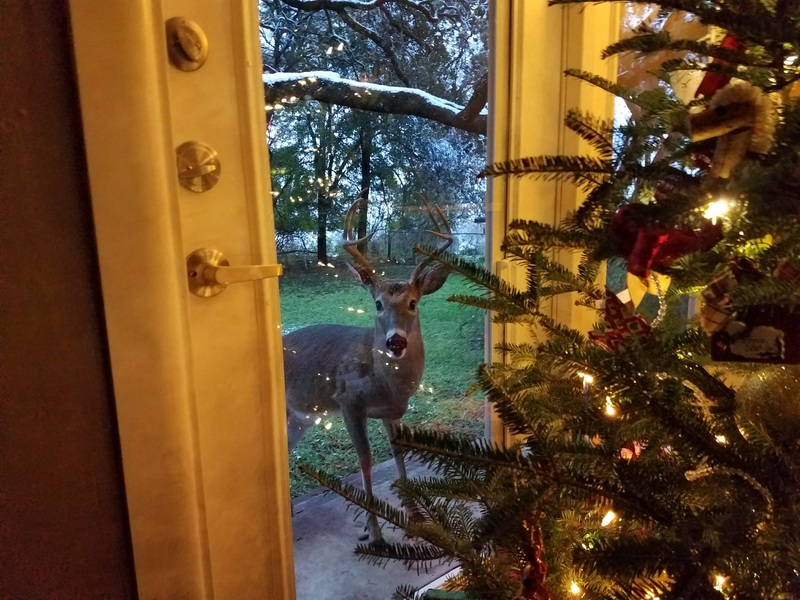 We even had a Christmas visitor looking into the house – the one we call Big Buck. We were sitting on the couch reading when Snow White said, “Mickey, look at the back door.” When I looked up from my book, there was what I could only describe as Santa’s Texas Contingent peeking into the window checking up on us. I hope he reported back good things! It was interesting to see the turning of the seasons: spring and summer fawns growing up, bucks and does separating into groups, yearling bucks getting their first horns, rut, pregnant does, and the winter followed by spring movement of the herd. The bucks especially, fresh off their first conquests and sorting into the hierarchy of Alphas and the rest were bolder in the winter. I supposed that contributed to Big Buck’s decision to sign up for Santa’s Texas Contingent and report back to the North Pole on our fitness for St Nick’s visit. 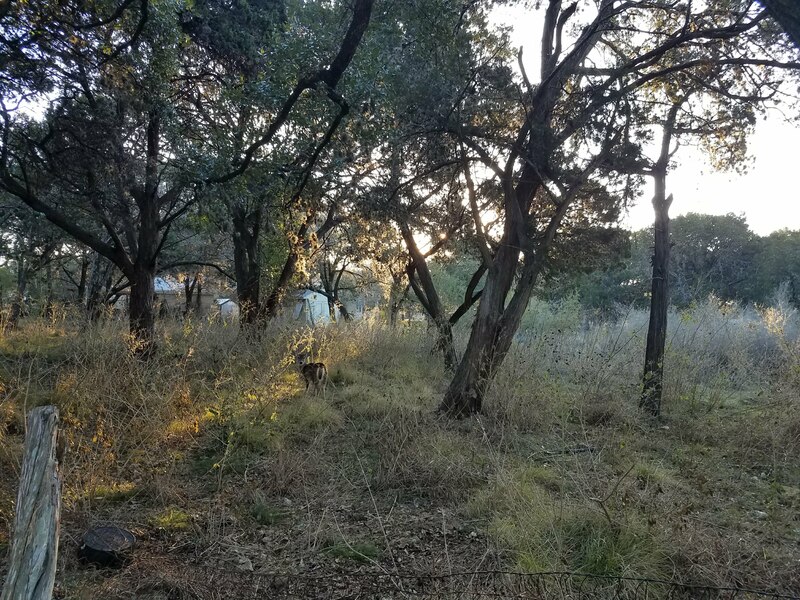 We’ll be moving from this house at the end of the summer to our “permanent” residence here in Comal County. I’m certain Snow White will soon be “mom” to a host of sweet little animals who will grace us with their innocent affection. When we move, we’ll take some great memories with us.